I'm a TJR Insta-Fan After This Book! *I received an advance copy of this book from Simon&Schuster Canada in exchange for an honest review* this does not affect my opinion. * Raise your hand if you've ever been in a reading slump. *raises my hand* And raise your hand if you have a very particular remedy that can maybe get you out of that slump. *raises hand again* Moving and unpacking last month threw me into a huge slump for everything that wasn't work, pretending to unpack, and napping. The fix for one of my reading slumps is almost exclusively graphic novels or a middle grade read. 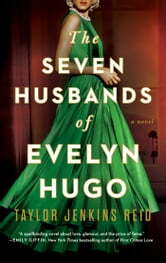 Alas, June snuck up on me and even though I wasn't out of my slump I had to start reading Evelyn. Imagine my surprise when all of a sudden I wanted to forestales every responsibility in favour of reading this book! MY SLUMP WAS BUSTED BY ADULT FICTION AND UNICORNS ARE REAL! I knew right from the beginning that I was going to LOVE this book. The writing is so incredibly captivating that you can't help but want more. It felt so real, as if I could feasibly be the one interviewing this mega Hollywood star but also super lush and out of reach at the same time. It was as if I was reading a movie. Taylor Jenkins Reid also did an incredible job of bribing the characters to life. I spent the entire book fighting the urge to go Google Evelyn Hugo because she was so compelling that I was positive she must be a real person. Even the secondary characters that appear in the stories of her early life felt like people I wanted to be able to look up pictures of. I wanted to go on Netflix and binge watch movies featuring Evelyn and her cohorts...all the time. I also loved Monique and all her flaws, ideals, and fierce ambition. She was a great person to place opposite Evelyn and her story arc was also captivating. Now the story itself was another stunning part of this read. It was full of the glitz and glamour one would expect from a tale of Hollywood but it also highlighted the underhanded side of life among the Stars. It wasn't an action book but it felt like the pace never slowed. I constantly wanted to find more and all the new info on Evelyn's life was like being on a roller coaster. You never knew what was going to happen or who was going to do what as part of a meticulous, calculated plan. It was intriguing, heartbreaking, and clever. Although a very flawed character, Evelyn also provides some very strong feminist messages. At one point she discusses the idea of women owning their sexuality and engaging in sexual activities for the purpose of their own pleasure versus it being merely a means to the end of keeping a male in their life satisfied. She's unapologetic about using men as they would and do use her. Although a slightly flawed and problematic approach, this is Evelyn attempting to level a playing field which is heavily not in her favour for many reasons. She is such a fierce and ambitious woman who shows us all that it's okay to want things and to try to actually get those things. Easy, enjoyable read with some real surprises. Highly recommend for an easy, captivating read with a lot of twists and turns. Old Hollywood at its most glamorous. Quite a contrast to today. Great escape read. Could not wait to reach the end, then was sad when it was over. Intigued until the end of the book! unique story and well developed characters!! The book captivated me! It was hard to put it down. The story is original, the characters are all interesting and complex, and there is a good twist at the end. Found this to be a good read with a few took my breath away moments . Don't want to reveal too much but would recommend for sure.